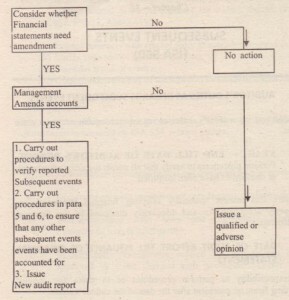 ISA 560 sets out auditor’s duties as regards subsequent events at three stages. Perform procedures to verify that all events requiring adjustment or disclosures have been identified. – Ensure that matters materially affecting financial statements are properly accounted for and adequately disclosed in the financial statements. No responsibility to perform procedures or to make any inquiry regarding financial statement after the date of the auditor’s report. 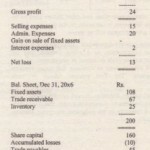 If the auditor becomes aware of a fact, which may materially affect the financial statements consider following steps. 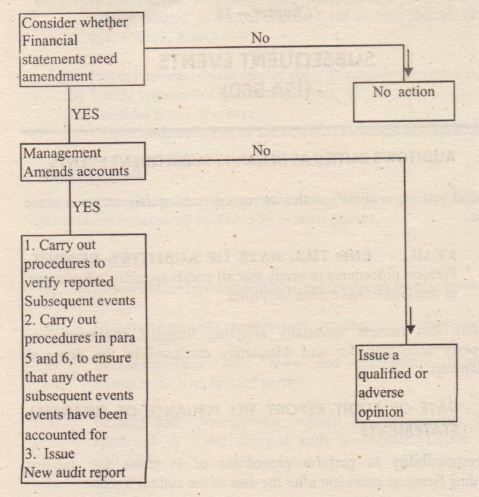 If the management issued financial statements without amendment, the auditor should take appropriate action in accordance with his rights and duties under the Companies Ordinance, 1984 the auditor may also consider seeking legal advice. 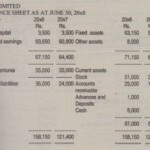 No responsibility to make any inquiry regarding financial statements. If the auditor becomes aware of a fact which existed at the date of auditors report and is known at that date, may have caused the auditor to issue a modified report, the auditors should consider whether the financial statements need be revised. The new audit report should contain an emphasis of matter paragraph as regards reasons for revision of previous financial statements and audit report.